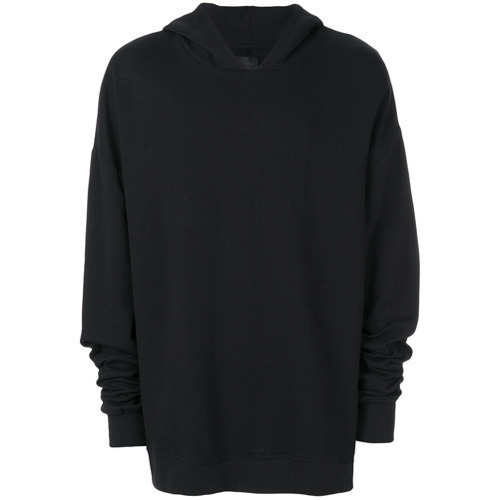 If you're on the lookout for a casual yet sharp getup, wear a Thom Krom hooded sweatshirt with blue jeans. Both pieces are very comfortable and look great when paired together. When it comes to footwear, this outfit pairs wonderfully with black low top sneakers. 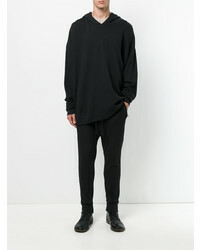 If you're on the lookout for a casual yet seriously stylish ensemble, wear a black hoodie and black chinos. These two garments are super comfortable and will look great together. Sporting a pair of black leather derby shoes is an easy way to add some flair to your outfit. If you're in search of a casual yet seriously stylish ensemble, rock a Thom Krom hooded sweatshirt with olive camouflage chinos. Both garments are totally comfortable and look great paired together. 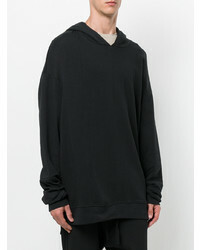 If you prefer relaxed dressing when it comes to fashion, you'll love this cool combination of a Thom Krom hooded sweatshirt from farfetch.com and black skinny jeans. 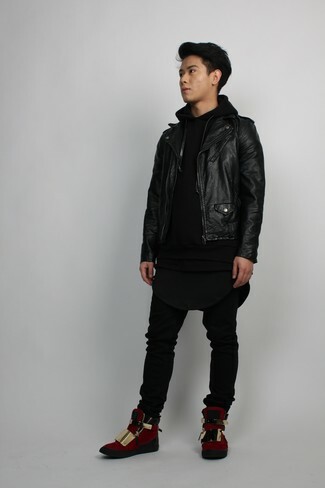 When it comes to shoes, this outfit is finished off nicely with burgundy suede high top sneakers. 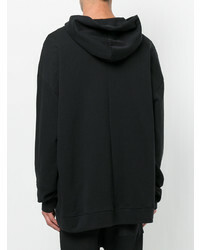 We all seek comfort when it comes to dressing up, and this combination of a Thom Krom hooded sweatshirt from farfetch.com and black ripped skinny jeans is a perfect example of that. Look at how well this ensemble is complemented with grey athletic shoes. A black hoodie and black jeans are the kind of a never-failing casual getup that you so awfully need when you have zero time to plan an ensemble. Up this whole outfit by finishing with dark brown suede chelsea boots. 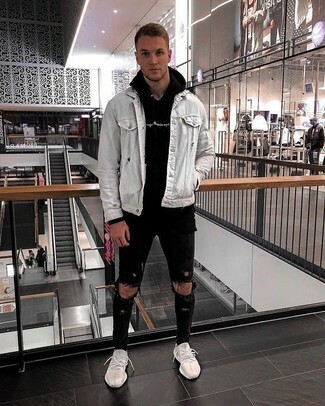 If you prefer relaxed dressing when it comes to fashion, you'll love this knockout pairing of a Thom Krom hooded sweatshirt and black ripped skinny jeans. When it comes to shoes, this getup pairs well with white athletic shoes. 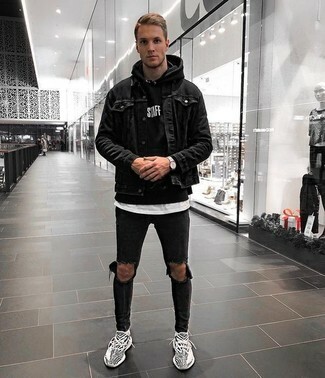 If you're scouting for a casual yet sharp outfit, consider pairing a black hoodie with blue jeans. Both pieces are very comfy and will look great when worn together. Opt for a pair of black leather plimsolls for a masculine aesthetic. 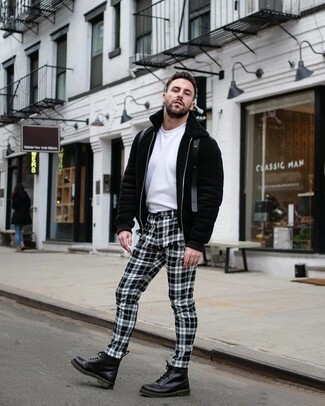 If you gravitate towards relaxed outfits, why not take this pairing of a Thom Krom black hoodie and white and black check chinos for a spin? 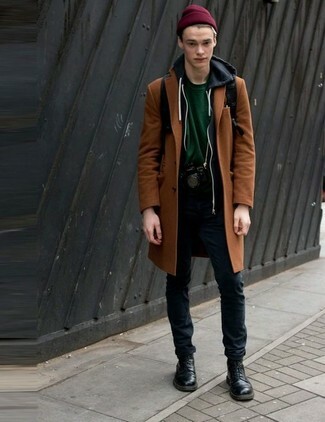 Add a pair of black leather casual boots to make the look slightly more refined.